At 41 minutes past noon yesterday Loek van Wely pushed a knight to c5 and offered Michael Adams a draw. At 41 minutes and not many seconds past noon Adams accepted and thereby secured the half point he needed to finish clear first in the strongest chess tournament held in Britain in the last two decades (according to the Staunton website at least). ... take a look at a position Morgan acquired during a casual encounter played in the bar the day before. Black's managed to get just about everything en prise but was still able to find a very pleasing combination to win the game. It's not a mate but is the answer: 1... Ng3+ 2 hg Qxf1+ 3 Rxf1 Rxf1+ 4 Kh2 Rcc1 5 g4 Rh1+ 6 Kg3 Rxh4, leaving Black with a rook and White with a knight? How about 1..Ne3, 2 Re1 Rxc1 3Rxc1 Qf1+? Well Angus has what Morgan actually played. I'm not sure about Chris' suggestion of ... Ne3. I'll have a look at it. That should have been "Alekhinesque" of course! your line certainly works so I started looking at alternative White responses to 1. ... Ne3. To be honest I was started to be convinced by it but then I put it on Fritz who pointed out that after 1. ... Ne3 Black wins in all lines bar one. Unfortunately White has one move that knocks Black out. Wasn't the king on g8, the h7 pawn on h6? 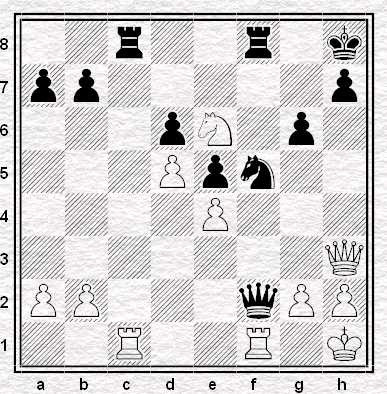 I reckon with Morgan playing, the black a-pawn would definitely have moved as well! Not quite my anonymous friend ... White can play g3-g4 and the king escape. Your line does transpose into the winning line given by Angus earlier. Possibly - I scribbled the position down pretty quickly. That Friday Feeling . . . Improve Your Chess VIII: Improve Your Chess!? Improve Your Chess VI: Join a Club! The Pen Is Mightier Than The Pin . . .